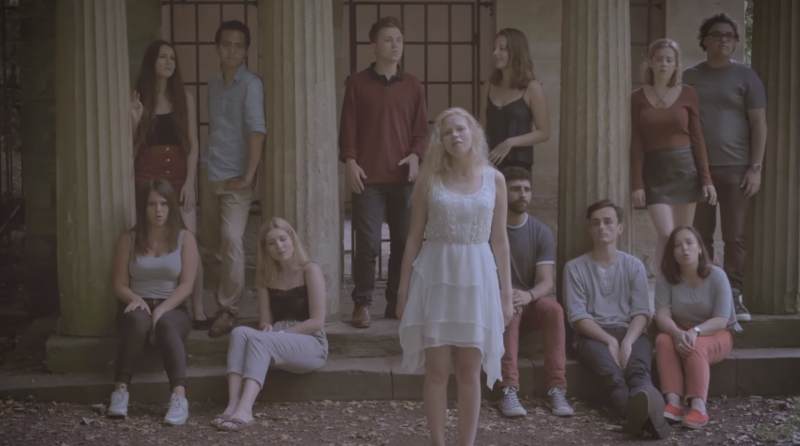 One thing is for certain, no one is singing off-key in this cover of Sia's "Bird Set Free." It's quite the opposite as this video couldn't be more polished, magnetic and compelling. In their newly released video, the Northern Lights of Durham University will leave you floored with their extraordinary rhythm section that's full of animated percussion and a well-mixed low-end that could potentially blow out your sub-woofers. Side note, prepare for the bass-goodness that hits at the second chorus. Wow! But it is not these two factors alone that make the video...every voice and every bit of production truly contributes to the magic. From the dark colors and somewhat vintage look of the video to the sheer force of the backing group, the entire experience is exciting. And the song's message cannot be denied, as it sends a message of liberation and freedom with its lyrics stating "I sing for love, I sing for me." And the group's soloist Rachel Dungate has range! From the massive big notes she delivers as the song progresses to her emotional evolution throughout, there's so much to love. Okay, enough with the praises, just check out the video below!